SUNNYVALE, CA--(Marketwire - July 15, 2008) - Fujitsu Computer Systems Corporation today debuted six LifeBook(R) notebooks powered by next-generation Intel(R) Centrino(R) 2 processor technology offering increased performance and longer battery life. Perfect for advanced users and consumers who want desktop performance and sophisticated style on the go, the enhanced LifeBook A6210 notebook features a stylish high-gloss black lid, bright 15.4-inch LCD display, wireless USB, faster E-SATA port, and a new gesture-enabled touchpad that lets users control many functions though simple finger movements for an enhanced interactive experience. Showcasing Fujitsu design ingenuity, the LifeBook T5010 convertible tablet PC, the successor to the Fujitsu flagship LifeBook T4220 convertible notebook, and the new LifeBook T1010 convertible tablet PC are equipped with a 13.3-inch display, and weigh in at 4.5 pounds and 5.3 pounds respectively -- among the lightest convertibles with the largest displays on the market. The enterprise class LifeBook T5010 convertible tablet PC offers a modular bay that can accommodate an optical drive or a second battery and supports Intel(R) Centrino(R) 2 with vPro(TM) technology, offering security and remote manageability on a chip. The LifeBook T1010 convertible tablet PC, which offers a fixed optical drive, and has all the power of the LifeBook T5010 notebook without the additional high-end security features required by enterprise customers, is more geared towards consumers, small businesses and educational institutions. (see separate release "Fujitsu Showcases Tablet Computing Design Expertise Introducing Two New Thin and Light 13.3-inch Widescreen Convertibles"). The LifeBook E8420 notebook, the new powerhouse of the Fujitsu corporate desktop replacement portfolio with comprehensive security features and performance on par with a desktop PC, supports Intel(R) Centrino(R) 2 with vPro(TM) technology. Rounding out the Intel(R) Centrino(R) 2 powered notebooks introduced by Fujitsu are the ultra-mobile 4-pound LifeBook S6520 notebook with a 14.1-inch widescreen Crystal View display, one of the thinnest and lightest in the 14-inch class, and the thin-and-light LifeBook S7220 notebook with a 14.1-inch anti-glare widescreen display and built-in webcam. "Fujitsu continues to integrate the latest Intel architecture to deliver enhancements in performance and battery life, which provide our customers with the power, features, and high reliability they need for an optimal mobile experience," said Paul Moore, senior director of mobile product management at Fujitsu Computer Systems. "With Intel(R) Centrino(R) 2 processor technology and our commitment to quality and customer service, our customers are assured of getting exceptional value and performance, whether they are consumers looking to combine mobility and great entertainment, mobile professionals looking for maximum productivity, or organizations, such as those in education, healthcare, and government, that demand high performance and high quality on limited budgets." "Fujitsu places a premium on delivering high-performance and reliable notebooks with the best technology available in the industry," said Brian Tucker, Mobile Marketing Manager, Mobile Platforms Group at Intel. "Intel(R) Centrino(R) 2 with vPro(TM) technology-based notebooks such as the new Fujitsu LifeBook meet the needs of the mobile workforce while providing many tools and new benefits designed to provide business value." The LifeBook A6210 notebook offers two 15.4-inch wide-screen display choices. Users can choose the Color Enhanced Crystal View display model for an enhanced viewing experience or the standard power-saving Crystal View LP display model. Both models feature an integrated HMDI port, which makes it easy to connect the notebook to high-definition televisions. The gesture touchpad translates finger movements into on-screen motions, for instance, parting two fingers to zoom in on a photo, simplifying and accelerating many activities. The Genuine Windows Vista(R) Home Premium operating system with Service Pack 1 enables an integrated home-entertainment experience that includes photos, music, video, and television. Options include faster 802.11n wireless for up to 450Mbps of upload/download speed, and an E-SATA port for faster data exchange. The LifeBook A6210 notebook also offers a choice of shared or dedicated graphics, an external ExpressCard TV Tuner, a fingerprint sensor for security and password management, and an optional Blu-ray(TM) ROM drive. The LifeBook A6210, LifeBook T5010, LifeBook T1010, LifeBook E8420, LifeBook S6520 and LifeBook S7220 notebooks are available to order immediately. The LifeBook T5010 and LifeBook E8420 notebooks will be available with Intel(R) Centrino(R) 2 with vPro(TM) technology in 30 days. The LifeBook A6210 notebook is priced at $1,149 (1) for a base configuration. The LifeBook T5010 tablet PC is priced at $1,769(1) for a base configuration. The LifeBook T1010 tablet PC starts at $1,299(1) with a $50 mail-in rebate. 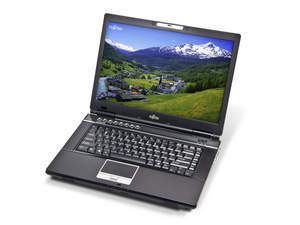 The LifeBook E8420 notebook is priced at $1,359(1) for a base configuration. The LifeBook S6520 notebook is priced at $1,529(1) for a base configuration. The LifeBook S7220 notebook is priced at $1,229(1) for a base configuration. All six notebooks are available through the Fujitsu direct sales force, website, channel partners and select retail outlets(2). Users can choose from a recommended configuration, or they can customize their system using the Fujitsu Configure To Order (CTO) program. See http://www.computers.us.fujitsu.com/store/index.shtml for further information. All six LifeBook notebooks are backed by a one-year International Limited Warranty for U.S. and Canadian customers. A three-year International Limited warranty is available at the time of purchase. The International Limited Warranty(3) includes technical support 24 hours a day, seven days a week(4), and unlimited online chat support. In addition, Fujitsu offers other warranty plans designed to meet the unique needs of mobile users. See http://us.fujitsu.com/computers for further information. Fujitsu is a leading provider of IT-based business solutions for the global marketplace. With approximately 160,000 employees supporting customers in 70 countries, Fujitsu combines a worldwide corps of systems and services experts with highly reliable computing and communications products and advanced microelectronics to deliver added value to customers. Headquartered in Tokyo, Fujitsu Limited (TSE: 6702) reported consolidated revenues of 5.3 trillion yen (US$53 billion) for the fiscal year ended March 31, 2008. For more information, please see: www.fujitsu.com. Fujitsu, the Fujitsu logo, LifeBook and TRIOLE are trademarks or registered trademarks of Fujitsu Limited in the United States and other countries. Intel, the Intel logo, Centrino and vPro are trademarks or registered trademarks of Intel Corporation or its subsidiaries in the United States and other countries. Microsoft, Windows, and Windows Vista are trademarks or registered trademarks of Microsoft Corporation in the United States and/or other countries. Blu-ray is a trademark or registered trademark of Sony Corporation in the United States and other countries. All other trademarks and product names are the property of their respective owners. (1) Pricing may change without notice. (2) Certain retailers will only offer select models. (3) Subject to International Limited Warranty terms and conditions. (4) Service and warranty repairs turnaround time may vary by country and product. Support 24 hours a day, seven days a week applies to the U.S. and Canada only. Subject to International Limited Warranty terms and conditions.